I have this horrible compulsive problem where I underestimate the time projects will take me. I know I don’t suffer alone, but sometimes I just cannot accept how horrible I am at time management. I had a million blog posts planned but I had to follow up with this year’s Thanksgiving debacle because it seemed important to share with everybody how sometimes even the best laid plans…well, you know. As I mentioned in the last post about how I overachieve Thanksgiving every year, I said I’d contribute cranberry sangria for dinner. This seemed like an amazing idea because a) who doesn’t love wine and fruit? and b) it seemed adorably festive and appropriate. This was before I researched whether cranberry sangria was a thing of course. I just assumed that hey, its a fruit and hey, there’s a juice for that so really it’s gotta be possible. I immediately noticed a problem upon researching recipes. Apparently cranberry sangria is some sort of fancy holiday concoction created by professional bartenders and people with a lot more alcohol skills than me. For example, as if I could find a recipe that didn’t involve brandy. What is brandy?! Finally I got tired of feeling like a total loser in the liquor store and I just put together a bunch of different recipes and worked it out. Surprisingly, Frankensteining the crap out of a bunch of alcohol has zero negative results and it tasted amazing, so I’m going to share it with you guys for your parties! 1 bottle of red wine * Side note, this sounds easy but hell it took FOREVER to find one that wouldn’t clash with all the cranberry I poured in there. I’m going to make your life a little easier because I’m a great person and say go to the California section in LCBO and track down a Zinfandel. There are a bunch that say Zinfandel White, but they’re pink. It makes zero sense and contributed to the ten whole minutes I spent staring at wine. Just don’t get that one. The best suggestion I can make is that I bought one called Dancing Bull Zinfandel and it was perfect, and didn’t seem like anything special so I’d say if you can find it in your LCBO, stick with that! 5 cups cranberry juice * Completely of your choice, I used cranberry cocktail because I have no issue with whatever they put in it that makes it not 100% cranberries but I know some people aren’t into that so use your own preference! 1 cup (!!!) Triple Sec *Don’t judge me. Add all the ingredients together and pop it in the fridge for at least a couple hours. I think the longer you leave it the better, and five hours is always the suggested chill time, but who has time for that? 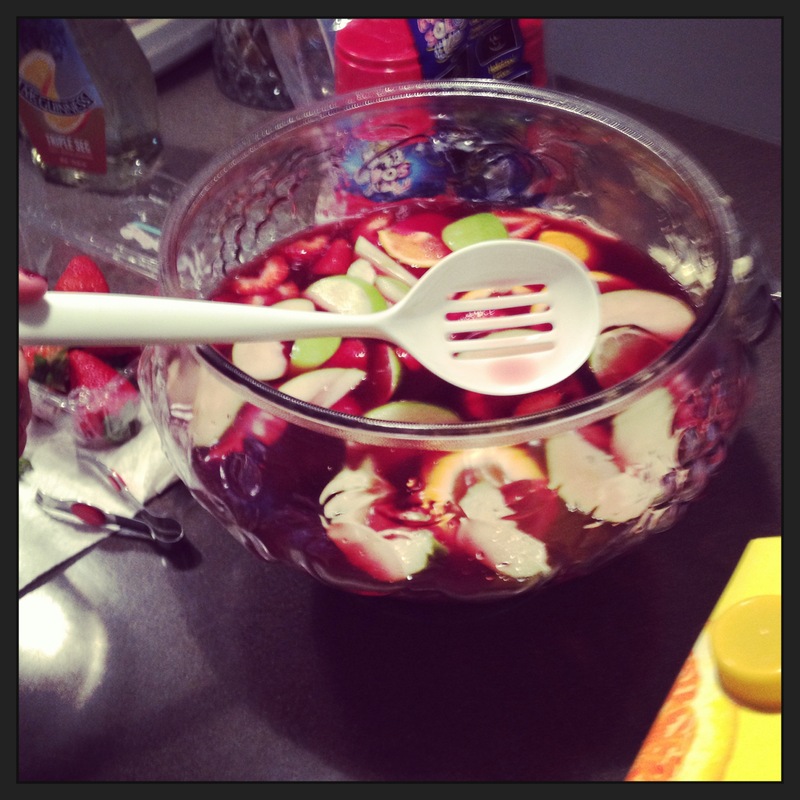 I chilled mine for about two hours before we broke it open and it was still great, and refreshing! Important tip: not all spoons are created equal. 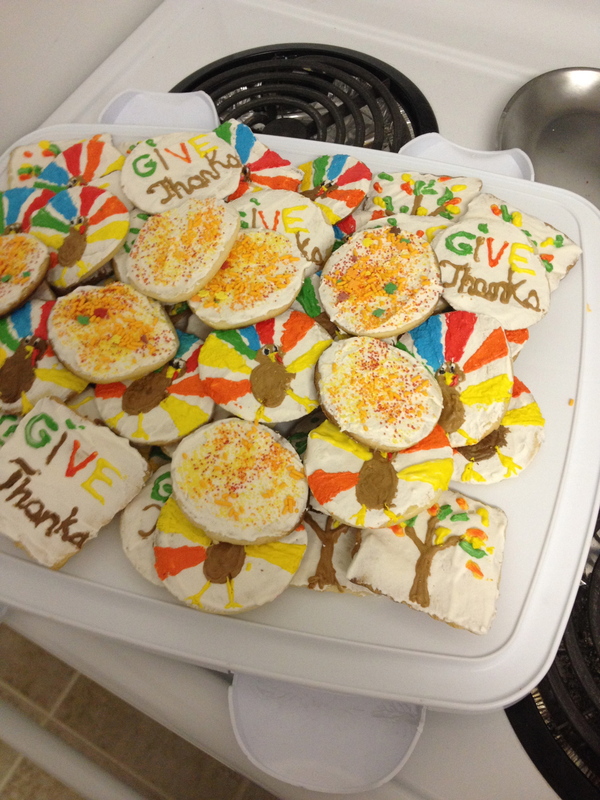 I also decided that I couldn’t let last year’s cupcakes disappear into history along with the other nontraditional Thanksgiving desserts, so this year I decided to do some sugar cookies and decorate them. I’m going to post the recipe I use and some better tips in another blog about a birthday party I did because those cookies looked infinitely more professional, but I wanted to share these here to make all those other procrastinators feel better. I got home around 7 (I worked until 5 and then stopped off at Target for a rolling pin, because I’d been using a wine bottle and for once didn’t have an empty wine bottle hanging around…which now that I think about it is probably embarrassing…anyways, and then Target became this huge ordeal because I have no willpower and so I was home by 7) and then baked the cookies and whipped up the icing and started to decorate around 9. Huge mistake. My motivation to draw turkeys did not extend beyond 10pm and they slowly started to look really cartoony instead of artistically magical. Not to mention my handwriting broke down around the same time and I wrote “thanks” wrong on the “give thanks” cookies about four times. So this wasn’t a huge success for my culinary portfolio (this, ladies and gents, is why hiring a caterer is never a weakness!) BUT the kids loved the cookies and everybody assumed I made them childish on purpose to appeal to all the under 5s and I just rolled with that because THAT IS WHAT PARTY PLANNERS DO, folks. I didn’t go to bed until 2am so by the time I got them there Sunday for dinner I was just grateful I was contributing anything edible. You can really see where everything started to go downhill. Anyways, I hope everybody had a great Thanksgiving, and don’t forget to check out our website thepartygirl.ca which should be up by the end of this week! So exciting!